Located at the edge of the Mediterranean in the resort of Saint-Jean-de-Monts, camping California **** welcomes you in the heart of a pine forest 4. 3 ha sheltered from the dune 5 minutes from the beaches ( 3. 5km). Young and old alike will be able to fully enjoy the aquatic area of ​​the campsite with outdoor swimming pool, water slide and paddling pool. A Jacuzzi is also at your disposal for moments of relaxation. You can also enjoy the indoor pool with bubble pool. During the day and in the evening, activities are offered for the whole family: sports tournaments, festive evenings, shows etc. A children's club welcomes 5-12 year olds in July and August where animators organize fun and manual sports activities. A playground is also dedicated to them within the campsite. Note: Animals are not allowed in the campsite. 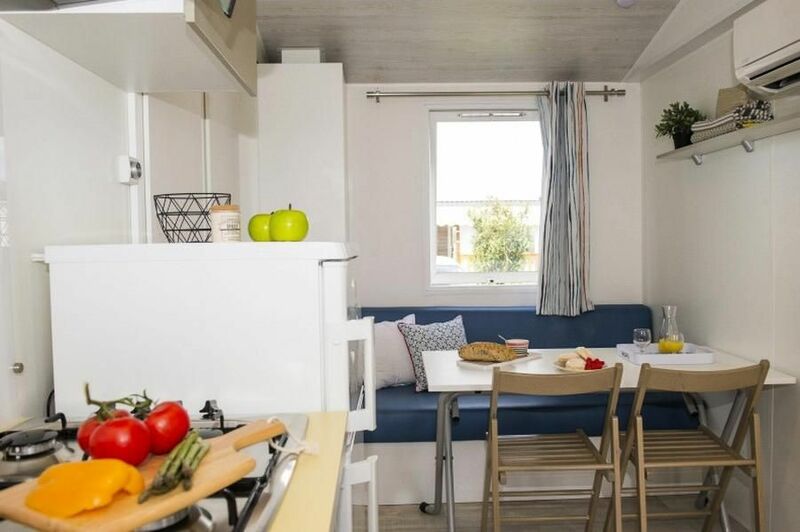 Mobile home, 3 rooms for 5 people composed of a living room with kitchenette and dining area with convertible sofa, a bedroom with a double bed, a bedroom with two single beds (80x190) and a bunk bed (not suitable children over 40kg) or a trundle bed, a shower room with separate WC and a semi-covered high terrace. The kitchen area includes, cooking lights, microwave, refrigerator. Terrace with garden furniture.